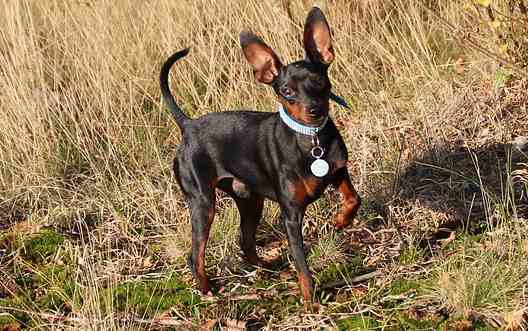 The Miniature Pinscher, also called the Min Pin, is a sturdy, compact little dog. They have a lot of poise and are actually very tough, especially for their size. 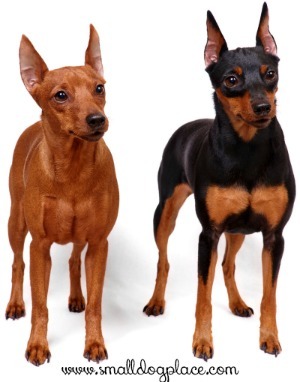 Despite their looks, they are not mini versions of the Doberman Pinscher, but perhaps cousins. They are a breed of their own and actually arrived on the scene about 100 years before the Doberman even existed. One classic characteristic of the Min Pin is their trot. They do not simply walk around like other breeds of dogs. They have a very specific pep to their step. The way that they walk is very often compared to that of a hackney horse. This hackney gait is absolutely adorable to watch and is one characteristic that is special to these little guys. The Min Pins is small, yet they have a very regal bearing and are actually called ‘The King of the Toys’. They have cute little ears that are sometimes cropped, but sometimes kept natural looking. In some European countries, it is illegal to crop them so they will remain natural in a lot of cases. Their tail, however, is traditionally docked. This breed has compact, catlike feet, which allow them to travel quickly and gracefully and add to the hackney trot. These little guys are surprisingly playful and love to play with everyone and everything. They love to run around and are like little athletes. If a small, cute and playful dog is something you might be interested in, then check out the Miniature Pinscher, and you might have found your perfect match! Experts claim that this breed goes back many centuries, but the exact origin of them isn’t very clear. The Miniature Pinscher was originally used for hunting small vermin, so they do have a little bit of Terrier in their blood. They got their start in Europe where they were called “Zwergpinscher” which translates to Dwarf Biter. This breed is the descendant of the German Pinscher, but their dexterity and small size inherited by the Italian Greyhound and the Dachshund. 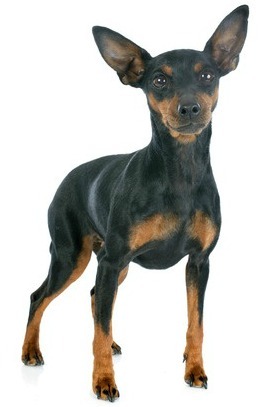 Some think that the German Pinscher had something to do with how they look, and since Dobermans come from the German Pinscher, maybe that is why they look very similar to the Miniature Pinscher. They were also used at barnyard ratters, and they controlled the rodent population in the stables. Min Pins are at the top of the charts in Europe for most popular toy dog, and the ratings are growing in American for this adorable breed. Oh, the Miniature Pinscher, where do we begin? 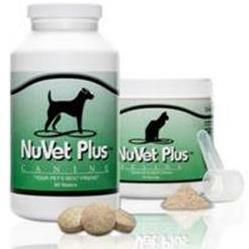 To start, this is one of the most active and energetic breeds of dog you will ever see. They are extroverts who have this special zest for life and definitely will show it. They need daily walks, in addition to other exercise to, maintain their small and compact physique. If you are a very laid back person, or are thinking about bringing this dog into a very laid back family, then maybe this isn’t the breed for you. 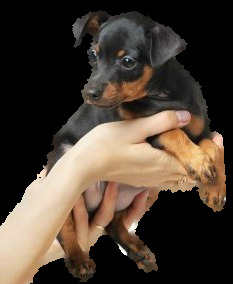 Min Pins are always on the move and need the exercise or they can develop behavioral issues or become sad or aggressive. It is not a chore to watch these little guys run around the backyard and trot around. They are extremely poised, and the breed standard actually calls them the dogs with fearless animation. Although they have a regal and pony-like gait, these are tough little dogs. They are excellent watchdogs and have great relationships with their families. Due to their Terrier and Dachshund roots, they do have a knack for burrowing. This may be a problem if they are outside trying to burrow out of your yard, but inside it is actually very entertaining and endearing. It is amusing to watch your little guy burrow in blankets or pillows for hours. They are funny little dogs in general, but watch out because they are known to be escape artists. Keep this in mind if you leave a door or gate open. They should probably be supervised while playing outside, so you don’t end up misplacing your little pup. 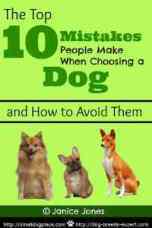 This breed is trainable, but they need lots of care and attention during it. 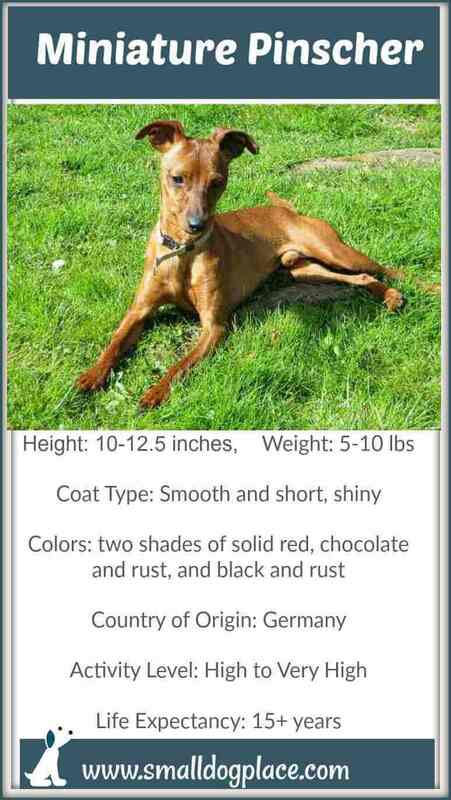 This is a suitable breed for families, but owners must be very patient and understanding during training. You don’t necessarily need to be an experienced trainer, but it is necessary to be prepared for the experience. It can sometimes take persistence and skill to train, but all the hard work is more than worth it when you have a beautifully trained Pinscher. These are the types of dogs that definitely benefit from an understanding hand during training and do not do well with yelling or hitting of any kind. If they are properly trained, then they will be willing and able to take on any task that they are presented with. It is essential to demonstrate authority early on, or training efforts could be tough. 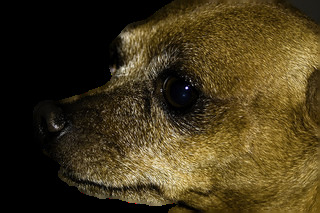 This is a type of dog that can suffer from Small Dog Syndrome, which is a syndrome in which the dog thinks that they are the owner and the boss. This could pose a problem in your household, and they need to be put in their place at a young age. With that being said, if they do get a proper socialization and training at a young age then you are golden. They get along great with children of pretty much any age and other pets, as well. They are adaptable and will do well with small living areas or apartments. If they do live in an apartment, they still require ample exercise to continue living a happy and healthy life. This is a breed of dog that can get along with everyone and be very happy with very little. It is important to keep in mind that this is not a lap dog, and will most likely not be happy to lie on your lap while you read. They are very tenacious and love to be active at all times. Other than that, you can bring a tough, loyal, playful, and cute dog into your home if you decide you want a Miniature Pinscher. Grooming is very minimal for this breed because of their short and smooth coat. The grooming for the Min Pin is actually the easiest and most minimal of all the Pinschers. This breed is an average shedder, so they do need to be brushed down occasionally to remove any loose hair. This can be done with a bristle brush or simply a warm washcloth. They should be bathed when needed and their teeth, eyes, ears, and nails need to be tended to regularly like any other breed. Aside from that, if you do not plan to spend a lot of time grooming a dog, then the Min Pin is the dog for you. This is generally a healthy breed, and the only real concern would be with their bones. They have small bones that are also pretty brittle, so special care and attention is needed, so they don’t break their wrists jumping off chairs or couches at home. Puppy stairs, or blankets can be a quick fix to this problem, but it is best to make sure your pup doesn’t have to jump too far to get down from anything. Breed Club: Miniature Pinscher Club of America, Inc. These books are available at Amazon and can be purchased directly from this site by clicking on the image. SDP receives a tiny commission from the sale and this helps keep this website up and working.